This is a glorious book - full of excellent drawings and photographs of every aspect of plants and flowers. Anybody wanting to know more about the botanical aspects of drawing plants will value it and its structured approach to dealing with all the different parts of various plant families. I value the fact this book is written by an artist, writer and lecturer who is an expert in drawing and communicating rather than a botanical artist. It means she brings a fresh and expert eye to the challenge of how to draw plants from a botanical perspective and an excellent approach to communicating the key messages. ....plus lots more tips about drawing! Sarah Simblet is an accomplished artist, author, tutor and freelance lecturer in drawing. She is also one of the most impressive artists and teachers that I know. ​She teaches drawing at the University of Oxford where she is a member of Ruskin College. 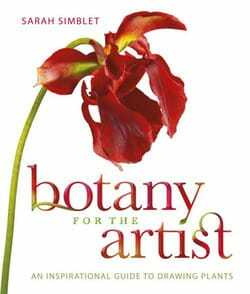 My only caveat about this book is that given Sarah's lack of credentials in this particular field (similar books are frequently written by RHS gold medallists and/or members of botanical art societies or florilegium societies) it would have been great to have an endorsement by the RHS or similar as to the approach contained in the book. Sam Scott-Hunter - his photographs are wonderful! before focusing on very specific aspects of botany. ​Each section contains at least one Masterclass which demonstrates what can be achieved. What I love about this book is that there was absolutely no sense of 'same old same old'. ​Every aspect of this book brings a fresh perspective from the way it is written and illustrated to the excellent material it accesses to illustrate points. The wonderful thing about Dorling Kindersley books is that they are always incredibly attractive from a visual perspective and this book is no exception. It immerses you in images of the natural world of plants which really stimulate the eye and lead you into every arc and angle of the plants. She introduces some of the key figures in the history of botanical art (eg Basilius Besler, Ferdinand Bauer, Georg Ehret, Sydney Parkinson) and some I'd not come across before! ​I loved the little bits of detail she includes about the reality of drawing plants which were botanical finds at the time. It's just worlds away from the contemporary botanical artist's studio - although those who draw and paint in the wild will appreciate the comment below! Banks wrote in tahiti "a mosquito net covers chairs, painter and drawings, but even that is not sufficient....flies eat the painter's colours off the paper as fast as they can be laid on"
She also covers how artists from different cultures and periods of history have chosen to record and draw and paint plants. One tends to forget that the conventional 'botanical art' approach is not the only way to record a plant for posterity. This is a book by somebody who is an expert in drawing and consequently a lot of the emphasis is on creating an accurate drawing rather than how to paint flowers using watercolours. What this means is that we get detailed explanations about how to convert a pencil drawing into a pen and ink drawing - which is an aspect I've often not found in a number of 'how to' botanical art instruction books. She has a wonderful talent for making botanically accurate drawings which are also very attractive. ​It's interesting to note a drawing of a branch of blackberry by Leonardo da Vinci which is included in one of the masterclasses which has many similarities to the style of drawing adopted by Ms Simblet. She's certainly at her best when unravelling a very complex plant. There are hundreds of accomplished drawings in this book which capture the character of the plant as if in its natural habitat - which is of course how it should be! this is NOT a 'how to paint' book and there are other books which cover this aspect much better. Each aspect (eg compound leaves, inflorescences etc) are tackled in a systematic way so that one sees a variety of examples of the way plants can present themselves. It's highly instructive in this respect - I saw connections between plants which had never struck me before. ​It's also fascinating to see the drawings next to tiny versions of the botanists symbolic drawings for eg inflorescences. I never knew there were so many and I certainly did not know all their names Now I'll know a 'compound corymb' next time I see one! For those wanting to really get to grips with the different technical parts and names of of plants for botanical illustration this book will prove to be an extremely useful reference due to the systematic annotation with names of many of the drawings. The text in each section is precise and concise and a little dense to read. However this is not a book designed to be read at one sitting. Many will just gaze at the drawings and the photographs for a long time before starting to read the text. I particularly liked the approach used for the masterclasses which include very impressive examples of botanical art both contemporary and historical. Many of the examples of historical botanical art are ones I'd never seen before (and I have many books about the history of botanical art). They include paintings by Maria Sibylla Merian, Mark Catesby and other well known names. ​I also liked the way Sarah identifies (with magnification) how the artist tackled specific aspects of painting the specimen - which is not something often seen in books about the history of botanical art. The contemporary artists - and again these feature people who often have not described their approach to painting before - explain how they tackled the specimen piece. These are used to focus on particular aspects of 'how to draw'. These typically take one topic and expand on how to tackle the subject matter to achieve the best effects. This book sits somewhere inbetween The Art of Plant Evolution and Valerie Oxley's Botanical Illustration and it's highly recommended by me. This was first published as a review on Making A Mark Reviews on 13 April 2010.